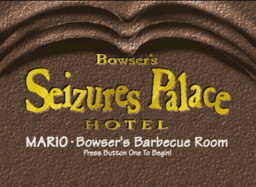 Bowser's Seizures Palace Hotel is the seventh and final hotel in the game Hotel Mario. The name is a pun on Caesars Palace, a hotel and casino in Las Vegas. It is the seventh and final hotel that Mario and Luigi must visit to rescue Princess Toadstool. This hotel also has nearly all the previous hotels' enemies, has similar double-sizes for each stage like in Wendy's Blitz Snarlton Hotel, contains 15 stages rather than 10 and introduces a fire obstacle. At the end, they must fight and defeat Iggy Koopa in a Bowser costume and then Bowser himself as the final challenge of the game. The boss stage is known as Bowser's Barbecue Room. In the ending sequence, the hotel is shown to crumble apart and collapse onto the ground as Mario, Luigi and the princess escape. This page was last edited on November 10, 2018, at 01:19.